Sermon for Christmas Day: "Christmas Paradise"
It’s beginning to look a lot like… Genesis 1. You thought I was going to say Christmas didn’t you. Well, for John, Christmas begins in Genesis. After all, the Gospel writers tells us the Christmas story each in their own way. Matthew gives us Joseph’s perspective. There’s the wise men, wicked king Herod, the slaughter of the innocents, and the flight to Egypt. Matthew teaches us that the cross looms large over Christmas. Luke gives us the dramatic, sublime Christmas pageant. And it came to pass in those days… Jesus’ birth is the greatest story of all; not only is it beautifully told, it is true. 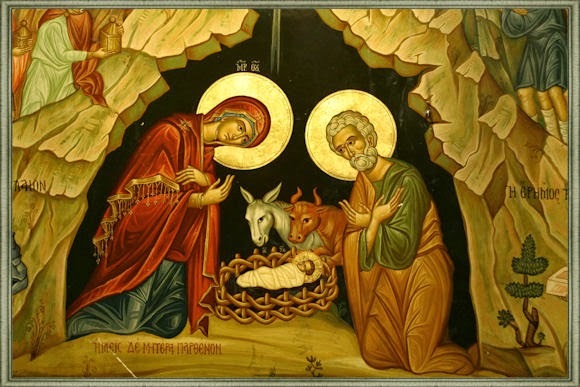 John gives us the best of both worlds: Jesus’s birth and Genesis 1. Christmas and Paradise. God is there in the beginning, just as we confess in the Creed and Catechism: Uncreated. Infinite. Eternal. Almighty. The One who is, who was, and who is to come. He is without beginning and without end. And yet John throws a little Christmas surprise our way. The Word was with God, and the Word was God. 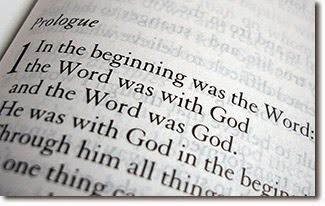 He was in the beginning with God. All things were made through him. If it looks like a duck, quacks like a duck, and waddles like a duck then it must be a duck. Everything Genesis 1 says about God – that he is uncreated, infinite, eternal, almighty, without beginning or end - John says this is also true of Jesus. Jesus is the Word…and the Word was with God and the Word was God. Like a master workman, Proverbs says, God spoke creation into being through the Word. 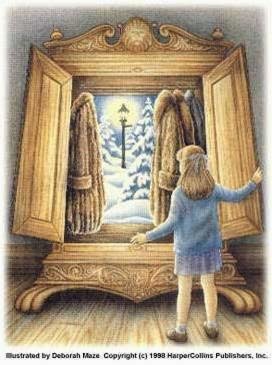 Or like Aslan in the Magician’s Nephew singing Narnia into existence. It all happened through the Word, through Jesus. So, Jesus was there when the heavens were stretched out like a tent and the sun was fixed as its lamp; he was there to smell the first noble fir and send the reindeer leaping across the field; and he was there rejoicing in creation. Behold it was very good. The Uncreated became a creature. The Eternal punches a hole right into time and space. The Infinite Word takes on finite flesh. The Almighty is born of a humble Virgin. All for you. Jesus, the Word of God in Genesis 1, comes for you in your human flesh in John 1 all because of Genesis 3. Jesus’ birth in Bethlehem has opened Paradise for you. For the words “Very good” spoken over creation quickly turned to “very bad”. Blessing turned to curse. Death ended life. Paradise lost. The gates closed, guarded by an angel. Adam and Eve in exile among the thorns and thistles. And all creation covered in darkness. With a single word, John describes our fallen world: darkness. Darkness without. And a heart of darkness within us. We’ve become lost and disoriented in the dark. We’ve filled the void and emptiness with the fear, love, and trust of creation, not the Creator. Repent. Cast off the works of darkness all you children of the day. Arise. Shine. Your light has come. In Him was life, and the life was the light of men. In Bethlehem, the Light shines in the darkness and the darkness has not overcome it. Redemption dawns in the dim lit room where the Almighty God is born a helpless child. The Uncreated, Eternal, Infinite Word has organs, bones, and skin. His every heart beat exists to take your heart of darkness and replace it with a new one. O come, let us adore him…born the friend of sinners. Today the ancient bond of condemnation in Adam is loosed. In Eden the devil deceived the woman, but now he sees a woman, a new Eve, become the mother of the Creator. And her Seed has come to crush the serpent’s head forever. 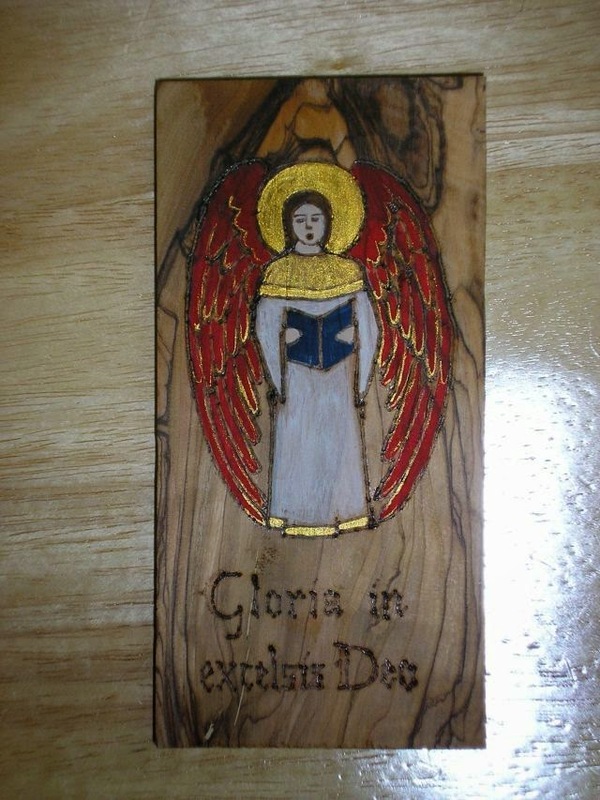 Jesus leads you safely past the angel’s flaming sword. Heaven’s door is open through a stable. Bethlehem has opened Eden for you. Your paradise lies in a manger. Join the animals who stand watch like the angels before their Maker. Join as heaven and nature sing the Gloria. While fields and floods, rocks, hills, and plains repeat the sounding joy. Unto you is born this day in the city of David a Savior who is Christ the Lord. The Word became flesh and dwells among you. O come, let us adore him. The Word who formed man from the dust has come with fingernails and eyebrows and kneecaps to reclaim his creation. In Jesus the darkness is banished. He has born the curse for you. Your sin is his. Your sorrows are his. Thorns and thistles adorn his head as he dies to set you free. O come, let us adore him. The Word who made the forests and the mountains has come with arms outstretched on a wooden cross raised up on a hilltop. There the Creator of heaven and earth suffered and bled and died for his creation. The one in whom we live and move and have our being was wrapped in clothes and laid in a tomb. And on the third day he burst forth, the first bloom of a new creation. O come, let us adore him. The Word who made the wheat and vine comes in bread and wine to you. The Word made flesh dwells among us, and for us. Here is your paradise in bread and wine. Taste and see that the Lord’s body and blood is good for you and your forgiveness. O come, let us adore him. Receive him. And rejoice. Every Advent and Christmas some of my favorite, must-read poems include the following two gems by G.K. Chesterton. Neither he nor his poems need any introduction. His sublime words speak for themselves. 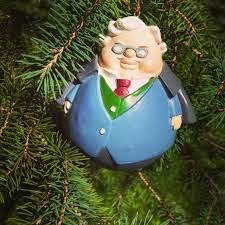 Enjoy the wit and wonder of Christmas with Chesterton. Both of these poems are found in The Man Who Was Chesterton: The Best Essays, Stories, Poems, & Other Writings of G.K. Chesterton. ed. Raymond T. Bond. Garden City, NY. Image Books, 1960, p. 410-412. 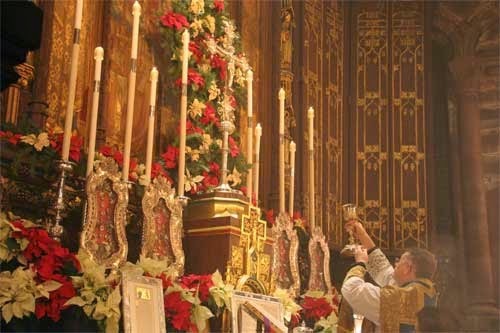 Sermon for Christmas Eve Midnight Mass: "Home for the Holy Days"
There you are sitting in driver’s seat. A cramp in one leg. The other leg asleep. Disney’s Frozen soundtrack has been playing non-stop for the last 725 miles. At any moment someone’s bladder will remind them it’s been twenty three and a half minutes since the last rest stop. Everyone’s tired and hungry. When the single most quoted sentence in all of travel history is blurted out. Our Advent waiting, preparing, and longing is a little like that, isn’t it. O Come thou Key of David, come…and open wide our heavenly home. Are we there yet? Is it is Christmas? Count the candles: 1 -2 – 3- 4; purple, purple, pink, purple…and tonight…white at last. The fast is over. Let the feast begin. 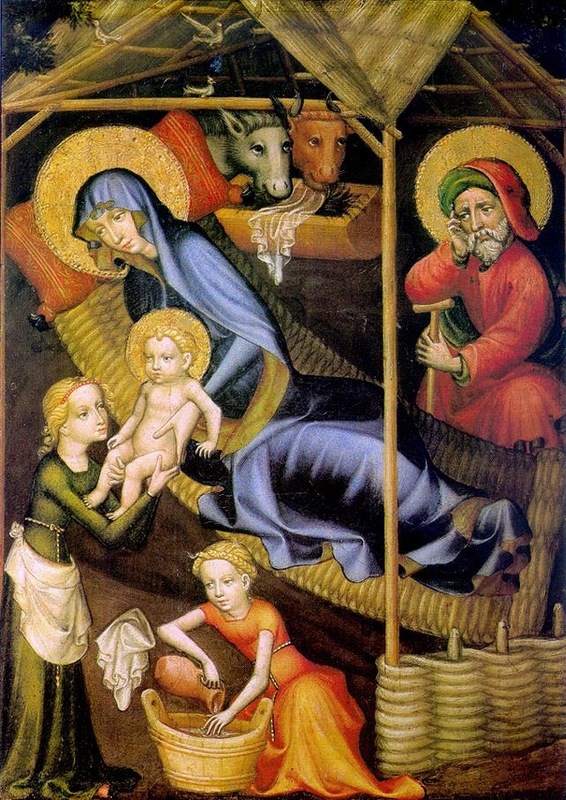 Don’t you think Mary was thinking the same thing as she was traveling pregnant on that luxury donkey? Joseph, are we there yet? You see this in the holiday movies too. The agonizing journey home, where everything that could go wrong does, and everything: traffic, weather, mechanical failures, gets in the way of a smooth trip, like Steve Martin in Planes, trains, and automobiles or Kevin’s mom racing home to New York in Home Alone. Even the radio blares it into our ears: there’s no place like home for the holidays. I’ll be home for Christmas, if only in my dreams. Well, wake up, you sleepy heads. This is no dream. St. Luke places Jesus’ birth right up there in the halls of history next to Caesar Augustus. And it came to pass in those days. You can just imagine the relief. Bethlehem on the horizon. Candlelit windows. Finally some rest. At last they had made it to Bethlehem, David’s home. Rejoice for this little child was born in darkness and in his gentle, fragile infant flesh we see Light of light, very God of very God. Rejoice, for we who dwell in the land of the shadow of death Jesus’ birth shines forth with uncreated light. Rejoice, for tonight… Jesus makes his home with us at Christmas to bring us home with him. She brought forth her firstborn son, and wrapped him in swaddling clothes, and laid him in a manger; because there was no room for them in the inn. Note well that though Jesus is a greater King than Caesar he is not born in the gilded, marble hewn Imperial palace in Rome or a picturesque seaside villa overlooking the Mediterranean. They laid him in a manger. For all of us city-slickers, that’s a feeding trough. You can just imagine the look on the donkey’s face when he stares into his food dish only to discover a baby…and no ordinary baby at that…his Creator. The beasts of the field bow their heads and worship as the angels before the Creator clothed in humanity. Jesus is born as you were. Born of a woman. Born under the Law to redeem us from the law. Born as we are: a son of man, to make us as he is: a son of the Father. Born homeless to bring us home. “Foxes have holes, and birds of the air have nests, but the Son of Man has nowhere to lay his head.” Jesus is born homeless for us who wander in sinful exile. Many long years we’ve wandered in the desert wasteland east of Eden. At times God has tested us. Other times the devil has tempted us. We’ve lost loved ones along the way. We’ve wrestled with sin. We’ve lost our way. Our sin which promised such pleasure, leaves only guilt and despair in us. We have not become gods like the devil promised. We’ve become orphans. Death hounds us at every turn. And we’re far from home. But all of that ends tonight. Your wandering is over. Jesus makes his home with us at Christmas to bring us home with him. Jesus is born in humility to bring you perfection in his life, death, and resurrection. Jesus was wrapped in swaddling clothes so that you would be freed from the snares of death. Jesus had no other place in the inn, so that you might have a room in his heavenly mansion. Your exile is over. The powers of hell flee before the little child. 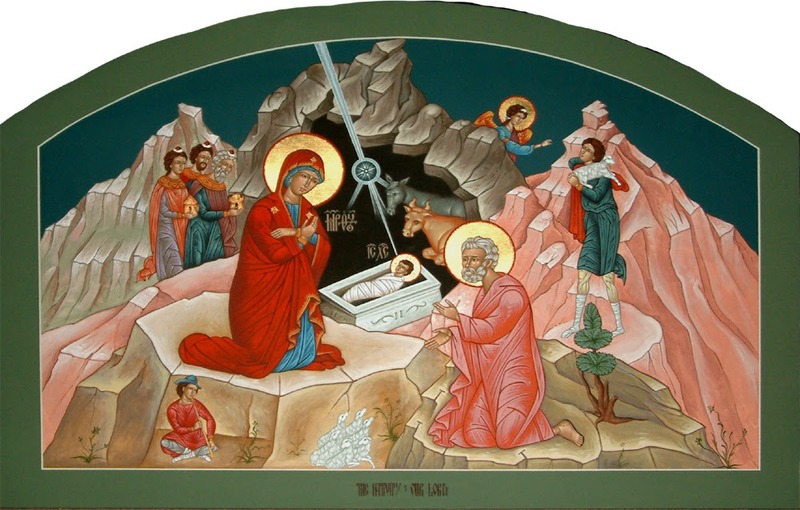 Death shivers at Jesus’ birth. Jesus, the rightful King, comes to bring you home from behind enemy lines. He is an infant warrior. Born to fight and die for you. This little baby, though being rich, for your sakes became poor, so that by his poverty you might be rich. He will be wrapped in swaddling clothes and laid in a virgin tomb. Jesus made his home in our flesh, to die for you, to make his bed in our grave, and to raise our flesh in his resurrection. In exchange for our lawlessness of sin Jesus bestows safety and security in his heavenly kingdom. In place of our loneliness and despair, Jesus gives us joy in the communion of saints, the forgiveness of sins, and the life everlasting. In place of our deathly exile, Jesus gives us a heavenly home. Jesus makes his home with sinners…to bring you home with him. For unto you is born this day in the city of David a Savior, which is Christ the Lord. The angels announce the message of salvation, not to the top of the social-political ladder, not in the halls of Caesar…but to lowly shepherds, with dirt under their finger nails, sheep manure covering their garments, and sinful hearts just like ours. Peace isn’t a feeling. Peace is a person: Jesus born for you. Born that man no more may die. Jesus is born to make makes his home with us at Christmas to bring us home with him. Death’s silence is broken by the shouts of good news and great joy. Sin’s darkness is dispelled by the Light of the world in a manger. The infant Son leads you back to your heavenly Father. Welcome home for the holy days. We’re here at last. Christmas has arrived. And once again, Jesus makes his home with us, and in a magnificent feast. The host you receive is Jesus’ house of bread. His body born for you is now present to forgive you. 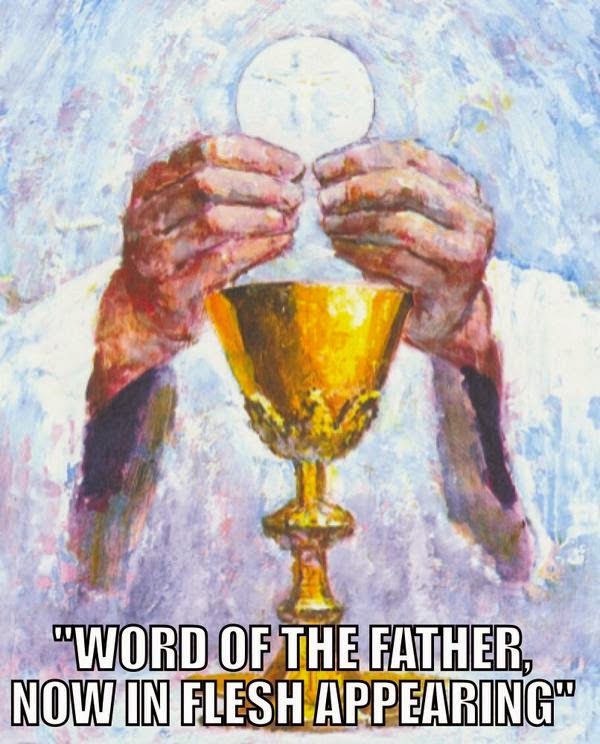 This cup you drink, it is true communion with his blood, shed for your forgiveness. The Promised Land is in view. Bethlehem is on the horizon. Christ is born for you. Welcome home. 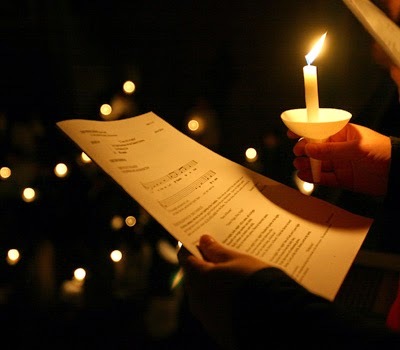 Sermon for Christmas Eve Lessons and Carols: "Christmas Songs and Stories"
Of all the ways we celebrate Christmas there are a few common ingredients we all have in common. We gather with our families around the tree and the table. We sing and tell stories. And we receive gifts and rejoice. Christmas is the season of stories. 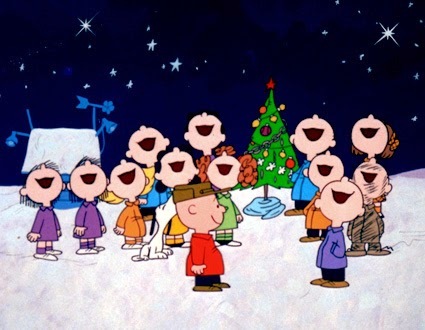 We watch Charlie Brown Christmas, Elf, or Christmas Vacation; we read Twas the Night Before Christmas, we chat with family and friends– these are all reminders that we love stories, especially at Christmas. Now the birth of Jesus Christ took place in this way. Tonight our families gather around the tree of the cross and the Lord ’s Table. We receive God’s gifts and rejoice. We sing carols and hear the lessons – the greatest story of all: Jesus’ birth to save you. It is an old story. One Jesus grew up hearing from Joseph in the wood shop: A Virgin will conceive and bear a son, and shall call his name Emmanuel. And yet here is the One in whom all the Old Testament stories find their fulfillment. For…Christmas is the story of your salvation. If Jesus’s birth is false, it is of no importance - no cross, no resurrection, no redemption, and we are still in our sins. But if Jesus’ birth is a true story, it is of infinite importance. The only thing the Christmas story cannot be is moderately important. Christmas is what separates Christianity from all the other stories. Many other Christmas stories contain shadows of the truth: Christ’s birth in human flesh is the reality. Jesus’ birth is not a fairy tale. Jesus was born in Bethlehem of Judea. In the days of Caesar Augustus. The nativity accounts in Matthew and Luke are real stories, about real people and real events. And yet they remain good stories. The best kind of all. Christmas is the greatest story of all, not only because it is beautiful, but because it is true. Christmas is the story of your salvation. Christmas is the birth of the Kingdom of God on earth. The Kingdom of God comes in the flesh and blood of a baby with soft skin and new baby smell. The arms that wiggle for his mother are the arms that stretched forth the heavens. The baby gently cradled and cuddled in Mary’s arms is the Lord who cradled clay and formed Adam from the dust of the earth. So too, Christmas is the birth of the church. It’s also your birthday. Everyone gets presents. On that first Christmas, when Jesus was born on earth, we were all born into heaven. Christ was born to saver every one of us, born in the sin of Adam. Christ took our place by being born on earth, and we take his place in heaven by being called children of God. This is the greatest gift exchange ever. You give Jesus your sin. Jesus gives you forgiveness. Jesus takes your death. And you receive his life. Jesus’ birth saves you. And one of the great signs that the Christmas story is true is that in the midst of the angels singing, the shepherds’ excitement, and the joyous mystery of God becoming man, there is also sadness. Jesus’ birth is not like a cartoon Christmas special with gum-drops, kittens, and unicorns. At first, Joseph thought the Son of God was born out of wedlock; the divorce papers were ready. Infant Jesus fled before the soldiers of wicked king Herod. Jesus’ childhood years, like Israel of old, were spent in exile in Egypt. Jesus’ birth not only draws us into heaven, but it also draws us to the cross. All of the slander and persecution that he would later know in death, began in his infancy. The joy of the Christmas story is not weakened or lessened by all of this. If pain, anguish, and suffering were absent then this story would reek of bad egg-nog. It would not ring true with reality. After all, Christmas isn’t always the most wonderful time of the year. Our lives are touched by sadness, grief, and pain. Broken homes, lost friends, sickness, death. In this fallen world we’re often the victim. But we can also be the villain. We sin; we bring sadness, grief, and pain upon others. But just where you thought your story and hope were ended. Jesus writes a whole new ending for you. It begins with the child in the manger, and leads to the man on the cross. Nails, spear shall pierce him through. The cross he bore for me, for you. Rejoice! For this helpless little One has come to help you who are helpless to save yourself. Here cries the One who knows your tears and sorrows. Here is the One who makes all your sadness, sin, and death his own. Crowned with thorns, nailed to a tree…the little Lord Jesus lays down his sweet head. You shall call his name Jesus, for he will save his people from their sins. This is why the angels sang good tidings of great joy. God does not demand that you grin and clean up in order to earn his love. In this is love, not that we have loved God but that he loved us and sent his Son to be the propitiation for our sins. God is born for you, as one of you. God knows your sorrows, even the ones you hide. In his cross, Jesus’ bears our sin and sadness. Already from the silent night of Bethlehem you can hear your Savior cry out: It is finished. Your sin is atoned. Death is not the end of your story. Christmas points you from the manger to the cross, and through the grave. Sadness turns to joy. Christ’s birth, death, and resurrection is your real-life happy ending. The stars in the bright sky look down where he lay. But he is not there. Christ is risen for you. Jesus lives for you. Like a children’s Christmas pageant, our celebration of Jesus’ birth is a story that comes alive, not only in our ears, but upon our lips. We’re drawn in. We lose ourselves in the story only to find ourselves in a new one which never ends. Christmas is the story of your salvation. So, Rejoice. Sing. Listen. Then sing some more. Again and again…like a little girl asking her father, “One more book, daddy?” Of course. Always. After all, this great story is worth repeating year after year. When most people hear the phrase "it's bigger on the inside" their minds first jump to Dr. Who, the beloved time lord of BBC fame. However, this phrase is older than even the original Dr. Who and TARDIS. Here's a short list of some of my favorite things, tangible or otherwise, that are bigger on the inside. Feel free to comment below and add anything you think ought to be included. My mother's purse (at least as a child). The entrance to platform 9 3/4. A book, preferably one filled with adventure, fantasy, and imagination. A hobbit's courage, especially Bilbo, Frodo, and Master Samwise. The portrait of the Dawn Treader in Eustace Scrub's house. The stable in The Last Battle. "It seems, then," said Tirian, smiling to himself, "that the stable seen from within and the stable seen from without are two different places." "Yes," said the Lord Diggory. "Its inside is bigger than its outside." "Yes," said Queen Lucy. "In our world too, a stable once had something inside it that was bigger than our whole world. So, on this Christmas Eve, it would seem that the list is incomplete without the two most important places that also qualify as bigger on the inside: The Virgin Mary's womb, and the manger wherein the Word made flesh is laid. And to this I would add a third, Christ's tomb for the Christ-Child is born that man no more may die. Born for our redemption, justification, and resurrection. Born to bear our sins on the cross and bury them forever in his tomb. For unto you is born this day in the city of David, a Savior, which is Christ the Lord. A blessed bigger-on-the-inside-Christmas to you. Advent 4 sermon: "Mission Impossible"
Rejoice, Mary. For you are the object of God’s favor. Undeserved. Unmerited. She is full of grace because the Lord gave it to her, as he does to you. And in the same manner: undeserved, unmerited. The Lord is with Mary, in a greater way than she realizes. The Lord is with you; it’s not just a statement of fact, it’s a promise. Do not be afraid, Mary, for you have found favor with God. Gabriel repeats the promise again. You too have found favor with God in Christ’s death and resurrection. Do not fear sin. Do not fear death. This child has come to bear your sin and die for you. Does that sound too far-fetched? Too good to be true? Maybe even impossible? Behold, you will conceive in your womb and bear a son, and you shall call his name Jesus. Jesus’ name means YHWH saves. He will save his people from their sins, the angel told Joseph in Matthew 1. Moses couldn’t get Israel to the promised land, but Joshua, whose name means YHWH saves did the job. The greater Joshua, YHWH saves, enters Mary’s womb so that you can enter an eternal promised land through him. It sounds like a mission impossible. 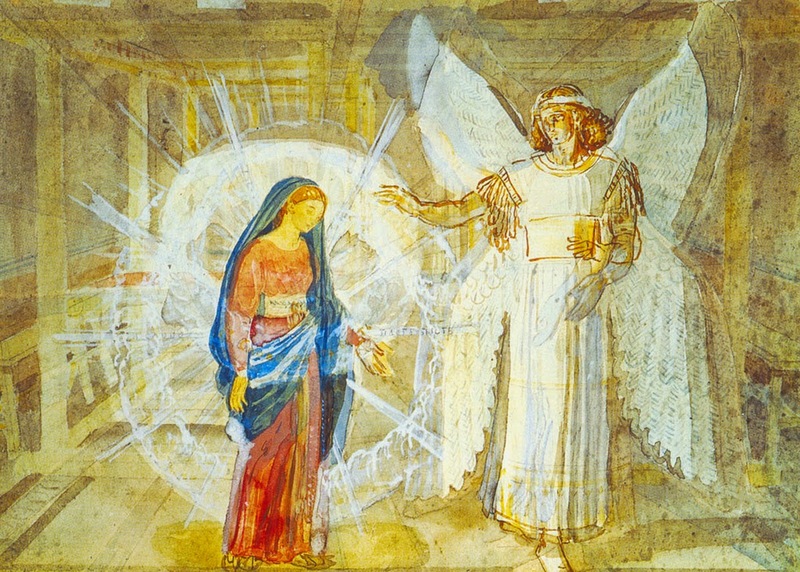 Mary doesn’t doubt what the angel says will happen. She believes. Mary heard the Word and within her the Word of God was conceived. Still, she wants to know how. She may not have taken biology 101 yet, but she knew what we all know: virgins don’t conceive. How will this be? We ask. How will this be since this child is called holy and my every desire, motive, and work is soiled with sin? How will a little child do the impossible and destroy death forever? I fail to keep the commandments. I fail to repent. I fail to love and serve my neighbor. It all sounds so impossible. How will this be since I am a sinner? In the Virgin’s womb, behold the impossible made possible for you. Christ’s incarnation is the grand miracle you need. Unlike the legends and fairy stories, it happened in a particular place, at a particular date, followed by particular historical events: Jesus lived. Jesus was crucified under Pontius Pilate. Jesus rose from the dead and was seen by over 500 witnesses. For you. The infinite God, the almighty Word, the Word through whom all things were made and in whom all things hold together, takes up residence in the Virgin’s womb. The Creator becomes the creature. God becomes Man. The Author enters his own story to write a new ending for you. 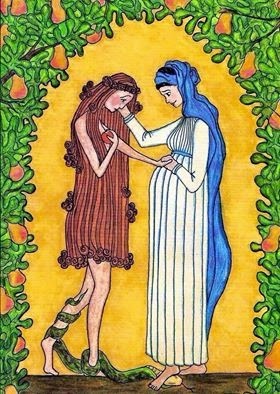 In Jesus, the fullness of Deity deigns to dwell in the womb of a human mother. Our humanity in its most basic and helpless form, is embraced by God. What modern man calls a myth, became fact. “The Holy Spirit will come upon you, and the power of the Most High will overshadow you; therefore the child to be born will be called holy—the Son of God. It’s a Christmas miracle. God comes to do the impossible for you. He moves heaven to earth and takes up earthly flesh and blood into heaven. His kingdom comes in human cells and tissue. The throne room of God is knit in Mary’s womb. 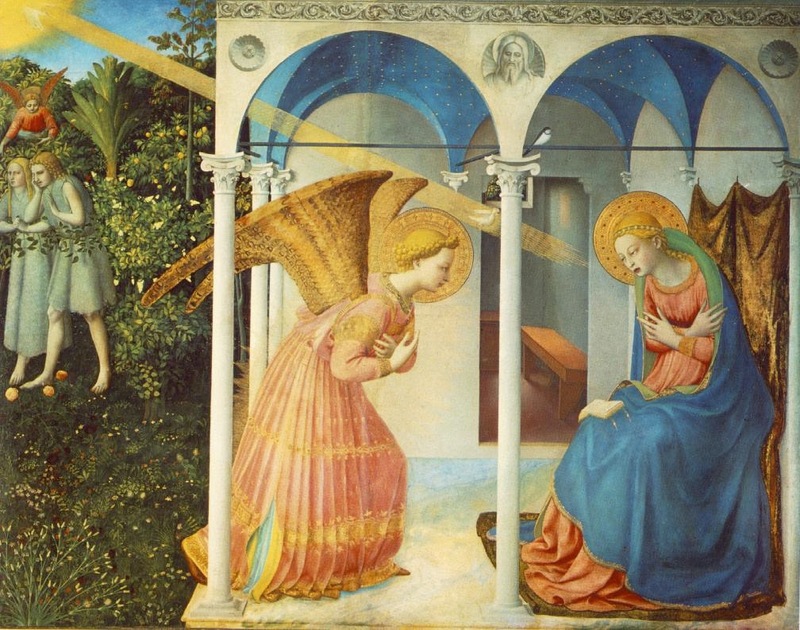 In fact there were three miracles Mary’s visitation: that God became man, that it happened through a Virgin, and that Mary believed it (Bernard of Clairvaux). That you believe and confess along with her is yet another miracle, the gift of faith. It is impossible for the Word of the Lord to fail. Nothing – even your sin and death – are impossible for God. That’s why this King is born, to overcome the sin and death which have overcome you. Jesus lets the power of death overshadow him on the cross so that he might call you holy. Jesus gives up his Spirit so that he might send the Holy Spirit upon you. Jesus dies so that you live. Jesus reigns, from the throne of Mary’s womb, to his coronation on the cross for you. Rejoice! O favored ones. The Lord is with you just as he was with Mary. The same Holy Spirit who hovered over the waters of creation and overshadowed the womb of Mary now overshadows the font where you are made a new creation. You are a child of God. You are holy. How will this be since this is just plain water? Certainly it is not just plain water. But it is God’s word and promise which make the font the womb of the church. The Word made flesh gives you new birth. Once again heaven comes to earth. Rejoice, o favored ones. The Lord is with you in the Holy Supper. His body and blood are enthroned in bread and wine for you. The King enters the chamber of your mouth to forgive you and bring you God’s grace and favor. How can this bread be Christ’s body, and this wine be his blood? The same Word of God spoken to Mary by the angel is spoken over bread and wine. Bread is his body. Wine is his blood. 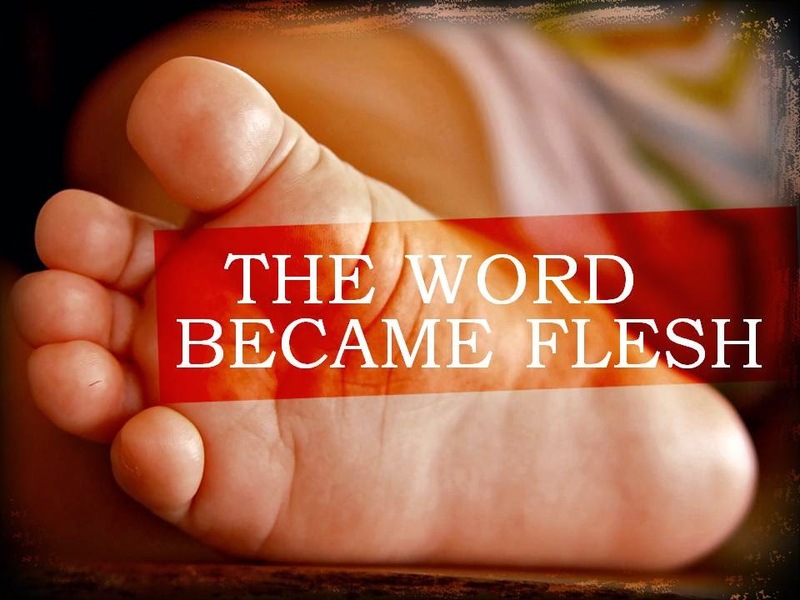 The Word made flesh dwells among us in His body and blood. You don’t need an angel to bring you good tidings of great joy. That’s why Jesus gave the church pastors. To announce: The Lord is with you. God’s grace and favor are yours in the humble signs of water, word, bread and wine. Your Baptism cleanses you from sin. The Word spoken by another brings you forgiveness. Bread is the Body of Christ and wine is His Blood is as marvelous and wonderful and out of the ordinary as an old woman conceiving in her seniority or a young woman conceiving in her virginity. Let it be to each of us, according to His Word. 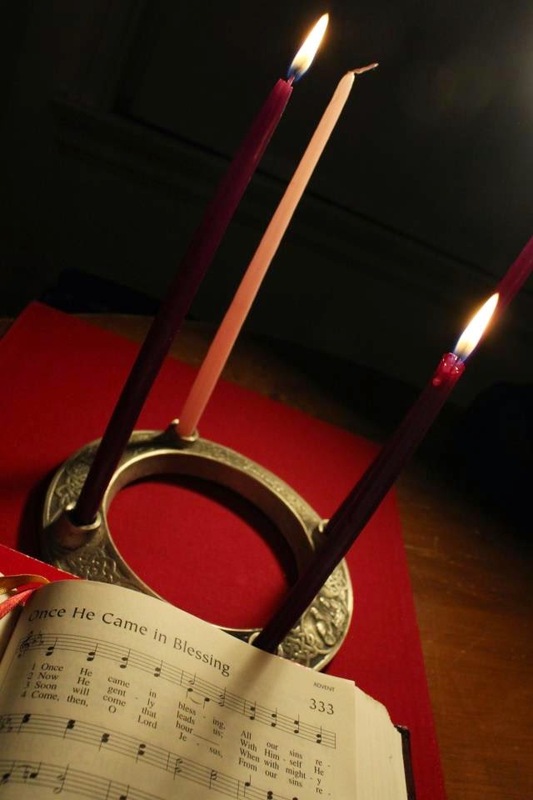 Advent Midweek 3: "Jesus' Advent in Human Flesh"
In Advent we sing the faith. We’ve spent the midweek services reflecting on the hymns of Advent. Hopefully they get good and stuck in your head whenever you leave church. Take them home. Read, mark, and meditate on the words. Sing, rejoice, and share them. In Advent our voices join with those who accompanied Jesus’ advent in human flesh with singing. After Gabriel’s visitation, Mary sang the Magnificat. My soul magnifies the Lord, and my spirit rejoices in God my Savior. At Jesus’ birth the angels sang the Gloria in Excelsis. Glory to God in the highest, and on earth peace among those with whom he is pleased. For unto you is born this day in the city of David a Savior. Did you hear the common word in all of those songs? Savior. This is Jesus’ name: Jeshua. YHWH Saves. His name is Jesus for he will save his people from their sins. Jesus saves you from your sin. And so in Advent we pray, confess, and sing: Savior of the Nations, Come. Just like the Advent season, this hymn is all about Jesus your savior. It’s a sermon set to music. It’s the Creed in song and poetry, a beautiful and faithful confession of Christ’s incarnation, suffering, death, resurrection, and ascension. For the Savior of the nations has come in human flesh to save you. We sing because we need a savior. Isaiah was writing about us too. We are the people who dwell in darkness and in a land of deep darkness. Sin clouds our minds in ignorance. We do not love the Lord our God with all our heart, and soul, and mind. Sin is a pitch-black abyss of unbelief. Sin is the darkness of the coffin lid shutting out the last ray of light. Like dogs we foolishly think we can bury our sins in the darkness so our Master won’t uncover them. Savior of the Nations, Come. Lighten the darkness of our hearts by your gracious visitation. For apart from you o Lord, who can be saved? Not by human flesh and blood, By the Spirit of our God. What is impossible for man is possible for God. The Virgin’s Son makes his home with us. 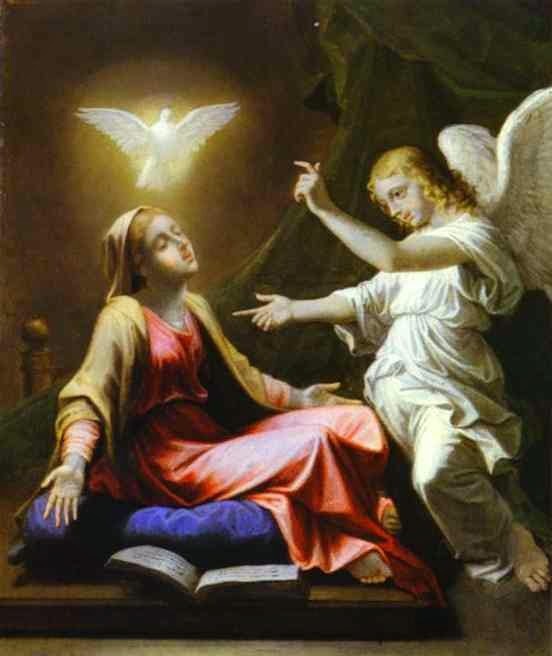 Jesus is conceived by the Holy Spirit and born of the Virgin Mary. The Son of God becomes our brother. Jesus is born in humility and darkness to rescue you from the darkness of death by his humility. Jesus is born in the darkness of a stable for us who sit in the darkness of sin and in the shadow of death. For unto us a child is born. Unto you a Son is given. Mary’s womb became the throne room. God assumes all of humanity into himself. In Jesus’ incarnation, not only does heaven come to earth wrapped in swaddling clothes, but heaven grasps earth. The God who cannot be seen is now seen in baby Jesus. The God who cannot be counted in days, weeks, months, or years, is born, grew in wisdom and stature, he died. All for you. The darkness of our sins is overcome by the Light of Christ that shines forth from the manger. For you the King of heaven rules and reigns from the straw of a feeding trough. For you God the Creator becomes a creature to save you and all creation. The Lord who is enthroned in the cherubim is pleased to surround himself with sheep, shepherds, and sinners. The Savior of the nations has come in human flesh to save you. And his birth is only the beginning. Back to God He ran His course. Back then to His throne and crown. In this Advent hymn we confess the entire Creed. The same Jesus who was born of Mary was also born to die for you. The Father sends his only Son to save us from our sins against him. The same Lord enthroned in straw and stable was crowned with thorns and pierced for you. The King of heaven fixed with nails to wood for you. Christmas sounds the horn of salvation. Your redemption is here. The infant King is on the move. And the thorns and thistles are in retreat. The rivers and fields clap their hands; the hills and plains shout for joy. Creation’s groaning turns to gladness. Jesus’ advent in human flesh is the sequel to Genesis 1, 2, and 3 – a sequel that no one expected to be written. Jesus comes to you written not in ink but wrapped in the substance of his creation, the Word became flesh. The Savior of the nation comes to you, not “once upon a time” or “in a galaxy far, far away” but in the days of Caesar Augustus, when Qurinius was governor of Syria. He was crucified for you under Pontius Pilate. Who in flesh the vict’ry won. All our ills of flesh and soul. Shines in glory through the night. In this light faith now abides. His birth. His life. His suffering. His weeping. His praying. His healing. His preaching. His bleeding. His dying. He did all of this for you. He did not die for his transgressions. He died for you. He did not need victory over sin and death, you did. That is why the Savior of the Nations came to you. To rescue you and all nations. His triumph over the devil is yours. In Jesus’ flesh your sin is defeated, your death is destroyed, and your captor, the devil is crushed by the Seed of the woman. God’s promise in Genesis 3 is fulfilled. The shadow of death swallow Jesus up on Good Friday. But the Light shines in the darkness and the darkness could not overcome Jesus. And neither will it overcome you. In Advent we sing the faith. The Savior of the Nations has come in human flesh to save you. And Jesus still comes to save you. Heaven comes to earth. In the bread and the wine upon our lips and in our mouths, God is there upon his throne. The Virgin’s son makes his home with you in your Baptism; you are a temple for the Holy Spirit. Marvel now o heav’n and earth that our Lord gives you new birth. By his mighty power you are made whole in Baptism. In the Supper the Savior of the Nations comes to heal all your ills of flesh and soul by his flesh and blood, given and shed for you. Advent 3 Sermon: "Can I Get A Witness?" Advent Midweek Sermon: "Jesus' Advent in Glory"
Advent 1 Sermon: "Hosanna, Lord Save Us"